This 50/50 (cotton/polyester) white knit wrap is 27 inches square. This wrap is single ply and accented with a pink or blue picot edge trimmed binding. 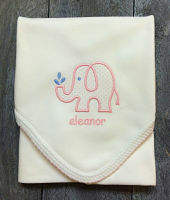 The baby's first name is embroidered under the elephant on the inside corner. This bath wrap is perfect for newborns. Each wrap is wrapped in tulle and white satin ribbon.